From the author of The Night Rainbow: a poignant, mysterious and unforgettable story of love, and of the happy endings we conceive for ourselves. Baptiste Molino has devoted his life to other people’s happiness. Moored on his houseboat on the edge of Toulouse, he helps his clients navigate the waters of contentment, yet remains careful never to make waves of his own. Baptiste is more concerned with his past than his future: particularly the mysterious circumstances of his birth and the identity of his birth mother. But Sophie, the young waitress in his local bar, believes it is time for Baptiste to rediscover passion and leads him into the world on his doorstep he has long tried to avoid. However, it is Baptiste’s new client who may end up being the one to change his perspective. Elegant and enigmatic, Amandine Rousseau is fast becoming a puzzle he longs to solve. As tensions rise on the streets of the city, Baptiste’s determination to avoid both the highs and lows of love begins to waver. And when his mother’s legacy finally reveals itself, he finds himself torn between pursuing his own happiness and safeguarding that of the one he loves. I was a big fan of The Night Rainbow, the authors' previous book, so I was a little apprehensive about reading this just in case it didn't live up to the first book. I should not have worried!! Wow!! I did get a copy of this via NetGalley in return for a fair and honest review, but as soon as it is released in hardback I will be buying a copy as the cover is just too gorgeous for me not to own it! There are also some beautiful illustrations inside to be enjoyed! It is quite a difficult book to review without giving too much away, but I'll try my best! The story begins on board a train as a woman ends up giving birth to a boy but she sadly dies during childbirth. A midwife who helps with the birth has been unable to have children over the years, so she sees this as fate and raises the little boy with her husband. Baptiste is a therapist who lives on a canal boat - his mind is set to analyse everyone and help them see clearer. But he seems unable to take his own advice and is obsessed with his past and seems unable to move on without wondering who he is and what his place is in the world. Things start becoming a little clearer for him thought when a client, Amandine, starts to challenge him. Something he isn't used to as he's normally the one who asks the question, but there is something about her that pushes him to question everything and start to analyse his own behaviour and purpose. I did find the beginning of this book a little confusing as it took a while for the narrative to settle down and become clearer, but it soon all clicked into place and made the reading experience even more pleasurable! 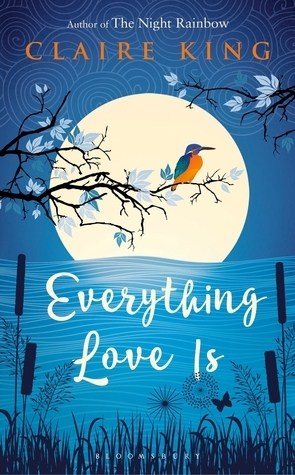 An extremely beautifully written story of love, family, heartache, hope, fears and dreams. Found so many passages really insightful and thought provoking and with such a powerful storyline it just adds to the layers. A stunner of a book - go read it!!!! 20 Books of Summer update! !